When it comes to botanical cocktails, gin is the perfect spirit to experiment with. Made from juniper berries, and usually up to ten other botanical ingredients, gin is a spirit inspired by nature. 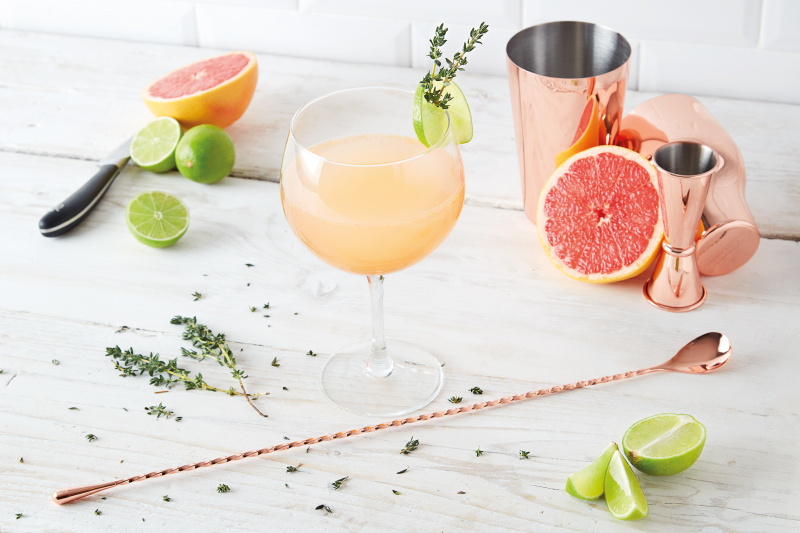 This recipe combines fresh, sharp citrus juice with earthy tones of Thyme for a cocktail that has a zesty kick. Cut your grapefruit and lime in half. Cut a slice from one of the halves of grapefruit around ½cm thick for garnish later and put this aside. Fill two thirds of your Juniper glass with ice. Juice the whole of the grapefruit and one half of the lime using the juice extractor and pour over the ice in your glass. Add 50ml of gin using the measure and 12.5ml of sugar syrup to take the edge off your citrus juice. Fill your glass to the top with tonic water. Add a sprig of thyme to your glass and stir with a long spoon, making sure your citrus juice and sugar syrup are mixed throughout. Cut the piece of grapefruit you had put aside in half and place one half into your cocktail as garnish. Let us know your favourite botanical cocktail recipes on our Home Chef Facebook Page. And if you enjoyed this one, why not try our Rosemary, Honey & Lemon Vodka Cocktail Recipe?